France is one of only a few European nations to use LBDs, which fire 40 millimetre rubber bullets that are considered to be non-lethal. Their use has come under scrutiny in recent months due to the gilets jaunes protests, which have prompted law enforcement to deploy LBDs against protesters that they consider to be violent. The human rights commissioner published a report on the issue this week, entitled “Memorandum on the maintenance of order and freedom of assembly in the context of the ‘gilets jaunes’ movement”. The report has no binding judicial power, but was produced as “relations between the police and the population are at risk of severe and long-term damage during this violent time”, the commission said. It was also created in part after a meeting with Laurent Nuñez, secretary of state for the French interior minister, in Paris. It asks France to “not use excessive measures against the freedom of peaceful assembly” and “suspend the use of LBDs during operations aimed at maintaining public order”. It also implicitly referred to France’s controversial “anti-vandalism law (loi anti-casseurs)”, which was voted in earlier this year and is set to be finalised in March. It would bring in stricter protest laws, especially in cases of violence, vandalism or unrest. 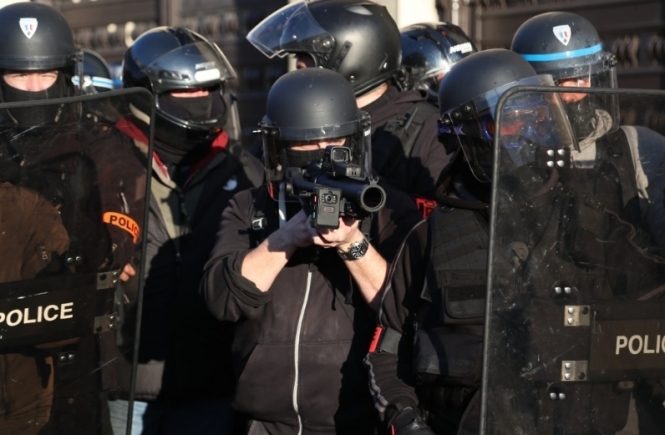 The report also took into account work by independent journalist David Dufresne, who has been attempting to document police violence during the gilets jaunes protests. Of 428 reports of violence to Mr Dufresne, 193 related to the use of LBDs, including 189 head injuries - despite official advice for LBD use saying that shooters should “aim for the torso and the limbs” only. But France rejects Mr Dufresne’s figures, calling into question “the rigour of the methodology” and said that “the figures brought forward by this source cannot be taken as established”. Human rights commissioner leader Dunja Mijatović “firmly condemned resorting to violence”, both among protesters as a “sign of discontentment” and as a response from authorities to social conflict. She added that “head injuries caused by LBDs show a disproportionate use of force, and the unsuitability of this type of weapon in the context of keeping the peace”. Ms Mijatović said that the wearing of cameras by law enforcement officers who use LBDs, and the requirement to start filming before shooting the weapon, offered further proof that there were “doubts over LBDs’ effectiveness”, and made LBDs “difficult and uncertain” to use in an “urgent situation”. The commissioner also said that the French practice of detaining protesters many kilometres away from the site of protest, coupled with the low levels of actual prosecution afterwards, suggested that “the objective was actually to stop people from taking part, rather than to punish them for a specific infraction”. The report also recommended that, in order to “reduce risk” of violence, law enforcement officers should receive enough “salary and rest time”, “appropriate psychological support”, and “solid training in human rights throughout their career”. The report comes as the gilets jaunes protests continue across France every Saturday, and in the same week as 14 protesters in Toulouse have filed official complaints against what they call excessive police violence. We ask for justice & significant compensation for the victims of the movement of #YellowVests. Several protesters claim to have been injured - or even lost an eye - due to the use of LBDs. France has contested the commission’s claims, saying that the LBDs are necessary to suppress unprecedented aggression by a small number of violent protesters.